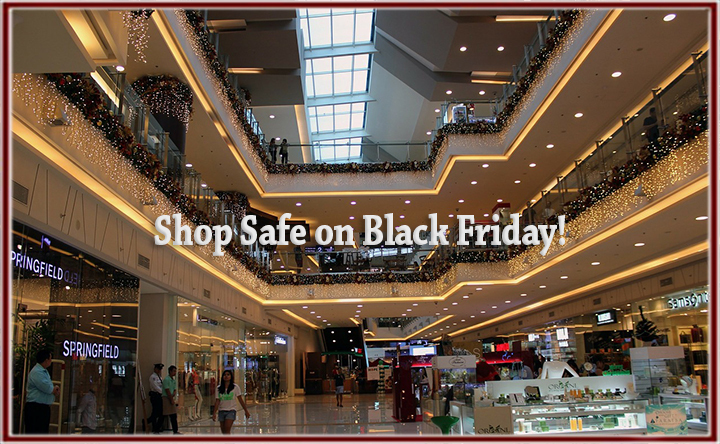 Shop Safe on Black Friday! - Scarsdale Premier Insurance Agency | Advocate Brokerage Corp.
Shop Safe on Black Friday! Come up with a plan of attack! Do your research and come up with a list of places that have the deals you find most appealing. Once you know where you want to go, make a plan of stores you will visit! If you are shopping with friends or family members, be sure that you pre-plan meeting places and times. Depending upon the location you are shopping, you could have dead spots in cell phone coverage and it could make reconnecting with your shopping buddies difficult. Predetermine how you are going to pay for your purchases. If you plan on paying in cash, take the money out of your account ahead of time to avoid ATM machines where thieves like to lurk. If you are using credit cards, make a photo copy of the card to leave at home. That way if you do become a victim of theft, you will have an easily accessible record of your account number. Charge your cell phone the night before. You don’t want to be left with no battery should an emergency of any type arise. Never park next to a big truck or unmarked van. It may sound silly but use your cell phone to take a photo of where you parked your car. Parking lots that are full cause lots of confusion and if you look confused, thieves will view you as an easy target! Have your keys out and in hand as you leave the store on your way to your car. Shoppers who are fumbling around in their purses for keys are another easy target for thieves. Store your purchases in the trunk of your car. Stay alert! Tips for staying safe once you are inside the store. Don’t carry a big purse or bag. Instead bring an option that is carried close to your body. Watch where you are walking and try not to be distracted by your phone or your surroundings. While waiting on line, do not take out your payment until you are asked. You don’t want a lurker taking notes on your credit card number or a pick pocket to grab your cash and dash.